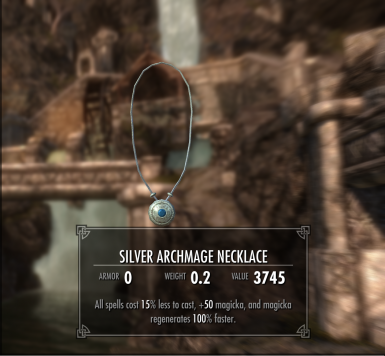 Port of the Silver Archmage Necklace From Oldrim to SSE by Gerolling. The .esp has been run through the Creation Kit and has been saved in form 44. It has also been cleaned with SSEedit to remove all ITM's. If you have any issues with the file, please let me know. I also have a non optimized version if the converted one has any issues. Please keep in mind that load orders and other mods may affect this but highly unlikely. A necklace with the same stats as the Archmage's Robe. "All spells cost 15% less to cast, +50 magicka, and magicka regenerates 100% faster"
Now you can have the Archmage's Robe effect and wear something else. I didn't like the original Archmage's Robe, so I made this necklace. You can find it in the Archmage's Quarters in a strongbox in the College of Winterhold (free access after you finish the Questline). I know it can count as a cheat, when you wear both the Archmage's Robe and the Archmage's Necklace, but that is something everbody has to decide for him/herself. I recommend this for every player who likes to play as a paladin or battle mage. This mod is usually intended for Battlemages and other classes that don't want to be burdened by having to wear the Archmage's Robes and get the same effect as them. However this can be used by any class that the player feels that fits their playstyle. If you would like to get the Necklace the easy way, you can open the console with the ~ key and type in: help "archmage necklace" 4 and get the ID of the necklace. That way you can add it to your inventory with the player.additem command. Manual: Just extract the .rar file and drop it into the Skyrim SE Data folder and activate the .esp through your Mod Manager. Manual: Just delete the .esp as normal from the Data folder of your Skyrim SE installation. This mod is not to be uploaded to another website or sold under any circumstances. It is a Nexus exclusive and its going to stay that way. I am not the original Author, Gerolling is. If you want to show appreciation, please consider endorsing the original mod. If you like this mod, please endorse it. This is my first "mod" so to speak even though it's a port. I will try and look over the post section every day as to see if anyone has an issue. Please keep in mind that I do work full time but I will always try and find time to answer questions and help out whenever I can. Good luck to everyone and I hope you enjoy this.